Housemade Warrandyte Café Pie, served with a side of chips, salad and relish. 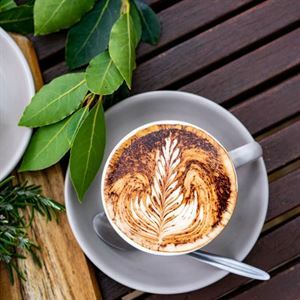 Located on the banks of the Yarra River, Warrandyte Café on Yarra Road offers good food, coffee and company for locals and visitors alike. 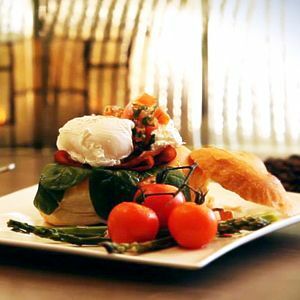 The quaint, rustic house with its balcony and garden, provide a welcoming atmosphere for diners to unwind, while enjoying the view through wooden French doors and windows. 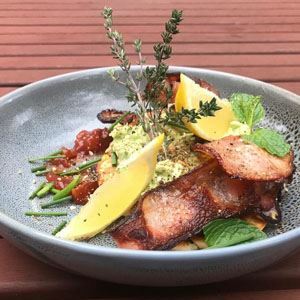 Take your dog for a stroll to the river and then settle in for a leisurely breakfast or lunch from a menu full of housemade fare, such as Spanish scrambled eggs with chorizo sausage, parsley, chilli and Yarra Valley Persian feta. Those arriving later may choose the corn and avocado fritters, layered with a choice of salmon or bacon, served with house relish and a sour cream and chive dip; or a beef burger on toasted Turkish with rocket, tomato, egg, bacon and a garlic mustard aioli.